As it's the beginning of the year, I've been doing the typical, predictable, completely clichéd 'new year, new me!' thing and thus far it's actually been going ok! I'm making a (somewhat) conscious effort to stop ingesting so much junk and make a few healthier choices. I've bought a liquid iron supplement to combat my persistent fatigue and I even now own a pair of running shoes. That's right. running shoes. 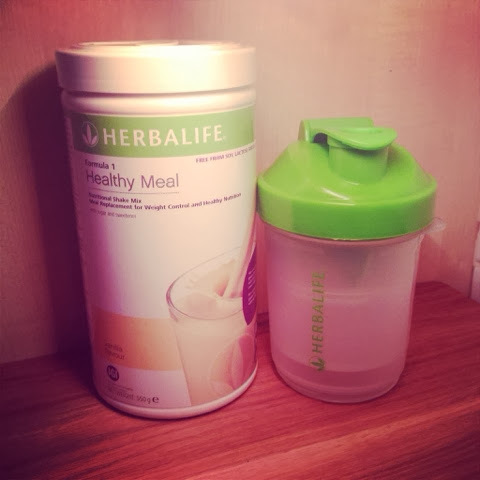 Another addition to my collection of healthy bits and pieces is this stuff - Herbalife Formula 1 Healthy Meal Shake*. This is a 'weight management' powder shake mix that can be used for weight loss and also just to add some extra vitamins and minerals to your diet. 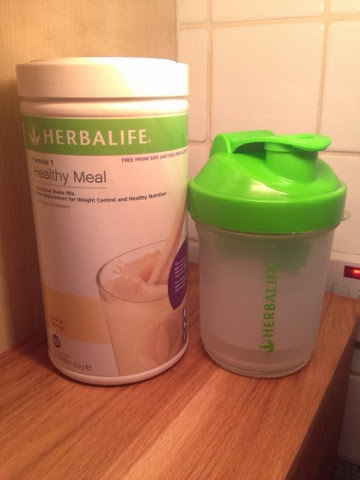 Combined with 250ml of skim milk (you can use water but I don't think it's quite as nice), the shake contains 220 calories which is pretty great really considering the recommended daily calorie intake for women is around 2000 and the My Fitness Pal App has recommended I have 1350 a day to shift a few pounds. So far, I've been having one shake a day in place of lunch for five days- for two of the days I blended up a banana with the shake to make a smoothie and this definitely left me feeling more satisfied than just having the powder mixed with milk. I'm looking forward to 'shaking' things up a bit and blending more fruits and grains up with the Herbalife powder to supercharge it and turn it into more of a meal. There are some fantastic ideas for creating a range of yummy shakes here on the Hip & Healthy site that you can find here at hipandhealthy.co.uk. Not only is the Formula 1 effective as a meal replacement but it would be great as a snack too- instead of reaching for biscuits or cake at 3pm, you could mix up a shake instead to satisfy sweet cravings and get some vitamins in you! But the big question is, how does it taste? 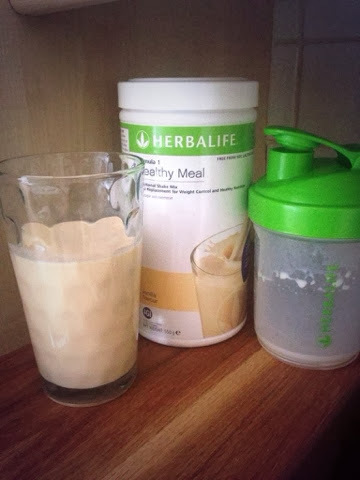 This stuff actually tastes pretty naughty- I chose vanilla because it's my favourite milkshake flavour and found that the Herbalife Formula 1 does not taste dissimilar to a vanilla milkshake, so this is a huge bonus. Herbalife Formula 1 is £27.60 for a 550g tub and is available in flavours such as chocolate, cookies and cream, vanilla, strawberry, cappuccino and tropical fruit. There is also a 'free from' vanilla flavoured formula (gluten and dairy free and contains pisane- a type of pea protein) especially formulated for people with celiac disease or lactose intolerance. I've actually been drinking the 'free from' formula and it's delicious- though I add milk to mine! You can find out more about Herbalife by visiting the website here. Have you tried any products from Herbalife?